The First Congregational Church of Norwich has a long history, deeply imbedded within the history of Norwich. 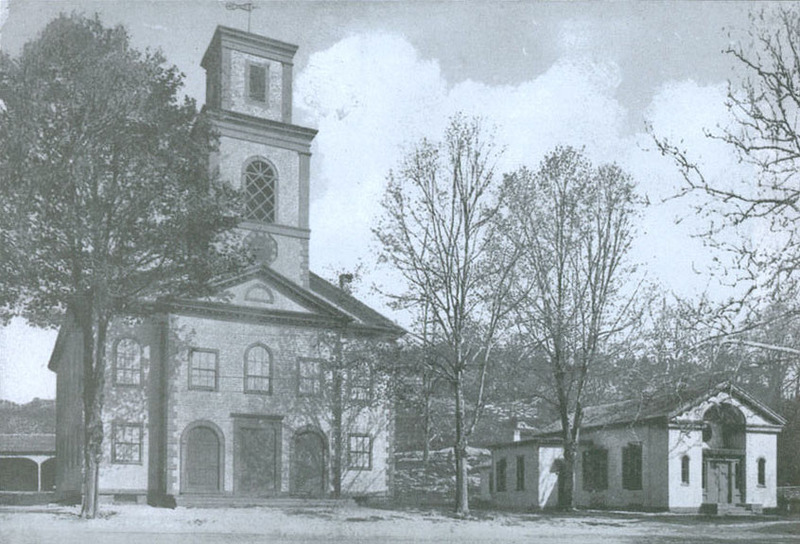 The current church building was built in the Federal style in 1801 and was the third building to house the local congregation. The rocky ledge west of the church's current location was the site in 1675 of the second meeting house in Norwich. Known today as the Meeting House Rocks, the place served a three-fold purpose as a place of worship, as a watchtower against the Indians, and as a garrison post. It is still a site for outdoor worship today by the church congregation. The location of the church today is the fifth meeting house erected in Norwich. The first meeting house, built around 1660, stood near the southeast corner of the Green. The second meeting house, erected in 1675, was on the summit of Meeting House Rocks and served as a lookout against Indian raids during King Philip's War. The third meeting house was built on the hill near the site of the old one and completed in 1713. The fourth meeting house was built at the corner of the Green, completed in 1770 and razed to ashes in 1801 by fire of incendiary origin. The cornerstone of the present Church, the fifth was laid on June 18, 1801, by General Ebenezer Huntington. The existing building is representative of the period when the huge, barn-like structures of the 18th century were becoming more ornate. This is evidenced by the square two-story tower projecting portico which repeats the rather flat lines of the roof and the corner quoins of the main building. The structure was extensively remodeled in 1845 and in later years. The First Congregational Church of Norwich was founded by some of the nation's most famous patriots and revolutionaries. Benedict Arnold and Samuel Huntington were two of our nation's founding father's that called First Church their home. The Church itself was the first and only meeting house for decades within Norwich and acted as a town meeting hall, political theater, and religious sanctuary all wrapped into one. This was a time before the existence of heating and air conditioning, where church services lasted all day, and the pastor's prayer was known to last an hour or two. During this time the church organ was powered by water in order to provide the weekly hymns for the congregation and Sunday School because there was no electricity. First Church has been credited with establishing the first Sunday School for miles and also establishing the first free school system. In more modern times the First Congregational Church of Norwich has seen much growth. From organizing and championing church softball and basketball leagues to a long time running Pilgrim Fellowship group, the Church always has had an active congregation inside and outside of weekly worship. Even to this day there are still annual events the congregation holds dear to their hearts. The annual Meeting House Rocks Fair, held each September, brings all members of the congregation out for food, fun, music, and some friendly games! The annual Christmas Pageant, set upon the hill of Avery Chapel behind the main church building each December brings all members out to gather together as angels and shepards to hear the Christmas story we all know so well. A Church favorite under the stars and in the chilly December air! The church also holds monthly themed dinners, sun rise services, auctions, craft sales, bizarres, and much more. The Church Family today continues to stay active within the Norwich community and through our own mission. A member of the United Church of Christ, First Church likes to remain an independent thinking body of worshipers, yet respecting the UCC mission as a whole. Come experience First Congregational Church for yourself!